On a recent trip I was chatting with one of our guests about a “pizza” I had rustled together the night before with some tortilla wraps as a base. 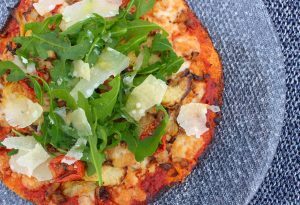 Hanan said that she had heard that you could use cauliflower as a pizza base and so I promised her I would try it out the following day. The pizza was a hit, I have been asked for the recipe and so I would like to share it with you. As promised Hanan, here is your “Lazy” Pizza Recipe. This recipe will make two pizzas approx. 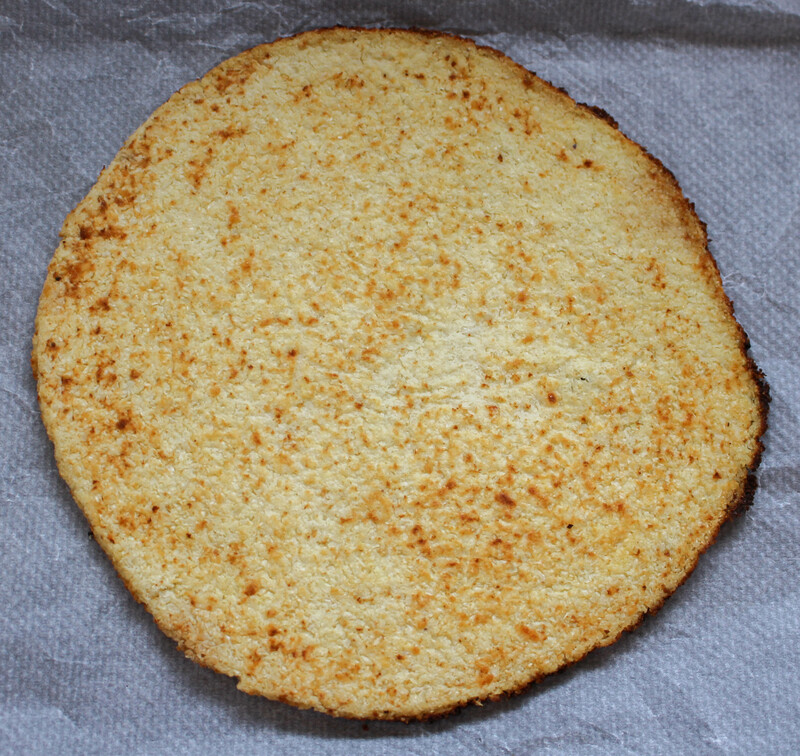 20cm diameter. You can make the pizza bases and sauce a day or two in advance. To make the tomato sauce, wash the tomatoes then slice them in half, making sure the interior of the tomato is exposed and not flat on the chopping board. Salt the tomatoes then leave them for at least half an hour to allow the salt to draw the juice out the tomatoes. Transfer to a bowl then in a large frying pan heat roughly 4tbsp of olive oil until it is hot but not smoking. 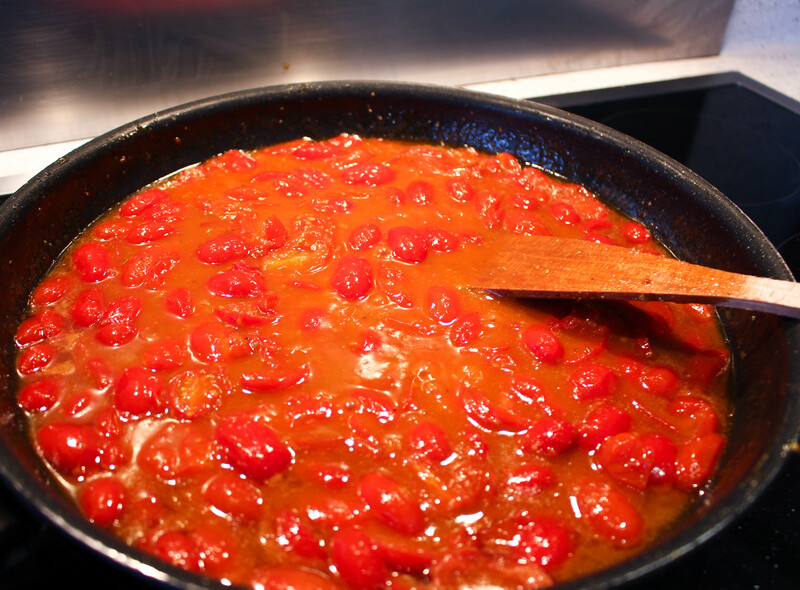 When you are satisfied that the oil is hot enough, carefully add the tomatoes and their liquor to the frying pan. This can sometimes make the hot oil spit so be very careful. Don’t touch the tomatoes at this stage just leave them to cook on this high heat for about five minutes. Now turn the heat down to a medium setting and stir the tomatoes with a wooden spoon. Add the garlic, tomato paste, red wine vinegar and a small squeeze of honey, stirring continuously. Turn the heat down low and allow the tomatoes to cook until they break down into a sauce (add a tablespoon of water or two if needs be). Pre-heat your oven to 200C. Using a food processor process the cauliflower florets until the cauliflower becomes a very fine texture, similar to couscous. Place the cauliflower in the centre of a clean tea towel then twist the tea towel to remove as much liquid from the cauliflower as you can. Take a large mixing bowl and add the cauliflower, egg, grated Parmesan, ground almonds, salt and pepper using your hands to combine the ingredients. Transfer the cauliflower mix to a baking tray lined with greaseproof paper (use some oil on the greaseproof paper as I have found that the base can sometimes stick). 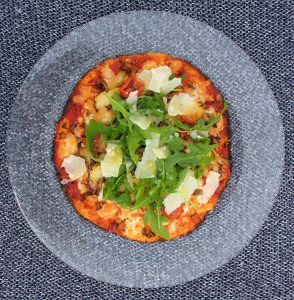 Using your hands, smooth out the cauliflower base but make sure that it is not too thin or it will fall apart once cooked but not so thick that the cauliflower becomes the dominant flavour of the pizza. I suggest approximately 3mm thick. Bake for about 15-20mins (until the edges start to brown slightly) then carefully remove the pizza base from the greaseproof paper and transfer to a cooling rack. If you leave the pizza base too long on the greaseproof paper it will stick and fall apart when you try to serve it later so it is quite important to get it on to a wire rack as soon as you can once it has come out of the oven. Once the pizza base has cooled and firmed up a bit take a clean baking sheet and line it with greaseproof baking paper. Place the pizza base on the greaseproof paper then top the pizza base with tomato sauce. Crumble some mozzarella over the top followed by preserved artichokes, sun-dried tomatoes, mushrooms, oregano, salt and pepper. Bake for a further 20mins at 200C (until the cheese has melted and caramelised). Remove from the oven and serve topped with shaved parmesan, rocket leaves and a drizzle of good quality olive oil to garnish.